Riesce ad individuare ostacoli da 3cm a 3mt di distanza con un campo molto ampio. Completamente assemblato e testato. L'SRF04 e' un sensore ad ultrasuoni che unisce delle ottime prestazioni ad un costo veramente conveniente. Con l'SRF04 utilizzare la tecnologia degli ultrasuoni e' alla portata di tutti. Questo sensore e' dotato di un microcontrollore che assolve tutte le funzioni di calcolo ed elaborazione, e' sufficiente inviare un impulso e leggere l'eco di ritorno per stabilire, con facilita', la distanza dell'ostacolo o dell'oggetto che si trova davanti. Riesce ad individuare ostacoli ed oggetti, anche di piccole dimensioni, da 3cm fino a 3mt. Come tutti i sensori di questo tipo, e' insensibile alla luce ambientale, quindi e' ottimo per essere usato all'esterno. Per applicazioni che richiedono maggiore precisione e/o portata, oppure un numero elevato di sensori di questo tipo, e' consigliabile utilizzare i sensori SRF08 e SRF10. Da notare che il campo visivo di questo sensore e' abbastanza ampio, sebbene questo si possa ottimizzare regolando la soglia, in determinate applicazioni potrebbe essere preferibile un sensore con un campo piu' ristretto, come ad esempio l'SRF235. The SRF04 Timing diagram is shown below. You only need to supply a short 10uS pulse to the trigger input to start the ranging. The SRF04 will send out an 8 cycle burst of ultrasound at 40khz and raise its echo line high. It then listens for an echo, and as soon as it detects one it lowers the echo line again. The echo line is therefore a pulse whose width is proportional to the distance to the object. By timing the pulse it is possible to calculate the range in inches/centimeters or anything else. If nothing is detected then the SRF04 will lower its echo line anyway after about 36mS. The circuit is designed to be low cost. 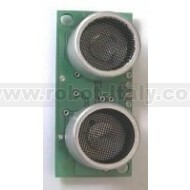 It uses a PIC12C508 to perform the control functions and standard 40khz piezo transducers. The drive to the transmitting transducer could be simplest driven directly from the PIC. The 5v drive can give a useful range for large objects, but can be problematic detecting smaller objects. The transducer can handle 20v of drive, so I decided to get up close to this level. A MAX232 IC, usually used for RS232 communication makes and ideal driver, providing about 16v of drive. The receiver is a classic two stage op-amp circuit. The input capacitor C8 blocks some residual DC which always seems to be present. Each gain stage is set to 24 for a total gain of 576-ish. This is close the 25 maximum gain available using the LM1458. The gain bandwidth product for the LM1458 is 1Mhz. The maximum gain at 40khz is 1000000/40000 = 25. The output of the amplifier is fed into an LM311 comparator. A small amount of positive feedback provides some hysterisis to give a clean stable output. The problem of getting operation down to 1-2cm is that the receiver will pick up direct coupling from the transmitter, which is right next to it. To make matters worse the piezo transducer is a mechanical object that keeps resonating some time after the drive has been removed. Up to 1mS depending on when you decide it has stopped. It is much harder to tell the difference between this direct coupled ringing and a returning echo, which is why many designs, including the Polaroid module, simply blank out this period. Looking at the returning echo on an oscilloscope shows that it is much larger in magnitude at close quarters than the cross-coupled signal. I therefore adjust the detection threshold during this time so that only the echo is detectable. The 100n capacitor C10 is charged to about ?6v during the burst. This discharges quite quickly through the 10k resistor R6 to restore sensitivity for more distant echo?s. A convenient negative voltage for the op-amp and comparator is generated by the MAX232. Unfortunately, this also generates quite a bit of high frequency noise. I therefore shut it down whilst listening for the echo. The 10uF capacitor C9 holds the negative rail just long enough to do this. In operation, the processor waits for an active low trigger pulse to come in. It then generates just eight cycles of 40khz. The echo line is then raised to signal the host processor to start timing. The raising of the echo line also shuts of the MAX232. After a while ? no more than 10-12mS normally, the returning echo will be detected and the PIC will lower the echo line. The width of this pulse represents the flight time of the sonic burst. If no echo is detected then it will automatically time out after about 30mS (Its two times the WDT period of the PIC). Because the MAX232 is shut down during echo detection, you must wait at least 10mS between measurement cycles for the +/- 10v to recharge. Performance of this design is, I think, quite good. It will reliably measure down to 3cm and will continue detecting down to 1cm or less but after 2-3cm the pulse width doesn?t get any smaller. Maximum range is a little over 3m. As and example of the sensitivity of this design, it will detect a 1inch thick plastic broom handle at 2.4m. Average current consumption is reasonable at less than 50mA and typically about 30mA. Download the source code and a ready assembled hex file. 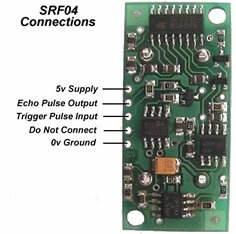 The SRF04 provides an echo pulse proportional to distance. If the width of the pulse is measured in uS, then dividing by 58 will give you the distance in cm, or dividing by 148 will give the distance in inches. uS/58=cm or uS/148=inches. You can't! This is a question which crops up regularly, however there is no easy way to reduce or change the beam width that I'm aware of. The beam pattern of the SRF04 is conical with the width of the beam being a function of the surface area of the transducers and is fixed. The beam pattern of the transducers used on the SRF04, taken from the manufacturers data sheet, is shown below. There is more information in the sonar faq. Since the original design of the SRF04 was published, there have been incremental improvements to improve performance and manufacturing reliability. The op-amp is now an LMC6032 and the comparator is an LP311. The 10uF capacitor is now 22uF and a few resistor values have been tweaked. These changes have happened over a period of time. All SRF04's manufactured after May 2003 have new software implementing an optional timing control input using the "do not connect" pin. This connection is the PIC's Vpp line used to program the chip after assembly. After programming its just an unused input with a pull-up resistor. When left unconnected the SRF04 behaves exactly as it always has and is described above. When the "do not connect" pin is connected to ground (0v), the timing is changed slightly to allow the SRF04 to work with the slower controllers such as the Picaxe. The SRF04's "do not connect" pin now acts as a timing control. This pin is pulled high by default and when left unconnected, the timing remains exactly as before. With the timing pin pulled low (grounded) a 300uS delay is added between the end of the trigger pulse and transmitting the sonic burst. Since the echo output is not raised until the burst is completed, there is no change to the range timing, but the 300uS delay gives the Picaxe time to sort out which pin to look at and start doing so. The new code has shipped in all SRF04's since the end of April 2003. The new code is also useful when connecting the SRF04 to the slower Stamps such as the BS2. Although the SRF04 works with the BS2, the echo line needs to be connected to the lower numbered input pins. This is because the Stamps take progressively longer to look at the higher numbered pins and can miss the rising edge of the echo signal. In this case you can connect the "do not connect" pin to ground and give it an extra 300uS to get there.